It’s not often that I find a blog or a person with whom I share many affinities. Food alone, yes, I’m pretty confident in my confidantes who weekly write to their newest food obsessions. Poetry is a bit harder to come by as most poets keep their work private until the hatching time of publication. Nicole Gulotta of Eat This Poem came to my attention through a friend and as I read her insightful deconstructions of poems that then inspired recipes, I found myself taken in by her sensibility. Then, I discovered we both share a passion for changing the food system and doing good with food through her other blog, The Giving Table. Naturally, we found ourselves in a bit of a good predicament and rather than start a mutual admiration society, decided we would make the last week in February fresh with guest posts. 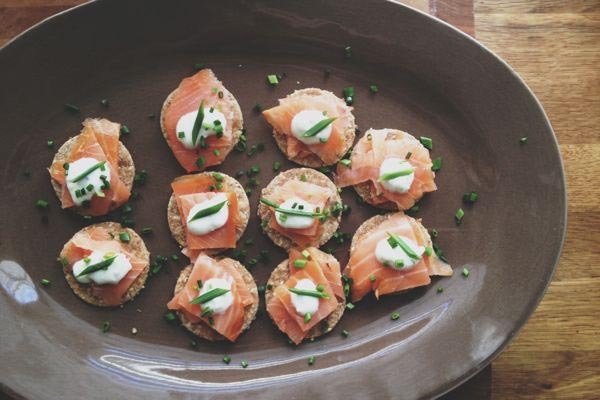 Today, she she shares her thoughts on breakfast and a reading of Rachel Wetzsteon’s “On Leaving the Bachelorette Brunch,” just before delving into a recipe for Sesame Crackers with Smoked Salmon and Chive Crème Fraiche. I think you’ll find both winsome. Perhaps it’s best to enjoy with a mimosa. Breakfast is a meal I’m quite particular about. I’m not keen on bacon and sausage early in the morning, nor do I enjoy rising early on Saturday to leave the house in order to have my first meal. Unless I’m traveling and decide to make an effort to avoid the overpriced room service menu, I believe breakfast is a meal for the interior and best enjoyed within the four walls I call home. Brunch—a meal usually beginning at a more civilized hour—I’ll happily get dressed for. I’ll sip a mimosa, and even eat something savory on occasion. It’s certainly a meal worth savoring, which is why it’s often the backdrop for social affairs such as a baby shower, catching up with friends, or in the case of this poem, a morning spent with bridesmaids. “On Leaving the Bachelorette Brunch” from Sakura Park by Rachel Wetzsteon. Copyright © 2006 by Rachel Wetzsteon. Reprinted by permission of Persea Books, Inc., New York. No part of this poem may be reproduced or transmitted in any form or by any means, electronic or mechanical, including photocopy, recording, or any information storage and retrieval system without prior permission, in writing, from the publisher. All rights reserved. It’s a dreary morning indeed, but there’s also some hope to be had. Wetzsteon does not imply that her friend should avoid marriage. Instead, she offers this wisdom: “Leave early, go home, become one with the one the world has told you to tend and treasure. The poem closes with a gentle reminder to “look at the birds.” It’s a call to observe, be present, and not neglect the relationships around you. Don’t forget the rest of us, she quietly says. While envisioning the scene of this poem play out, my mind turned to the usual fare of quiche, scones, and fruit. For brunch, I enjoy offerings that are elegant and understated, and it’s particularly wonderful when a dish appears to have taken more time to create than it actually did, so this recipe will be our little secret. I recently made this appetizer for two occasions. First, New Year’s Eve dinner with my husband, and second, for an office baby shower I threw for a friend. The crackers are a perfect bite, easy to eat and prepare in advance, and they look darling on the platter all dressed up with salmon and a dollop of chive crème fraiche. If serving all the crackers at once, you’ll want about 4 ounces of smoked salmon. I had bookmarked these crackers from The New York Times for a rainy day. You can easily make them in advance and store in an airtight container at room temperature. The original recipe calls for whole-wheat flour only, but I modified that slightly. 4 to 5 tablespoons water, or as needed. Preheat the oven to 350 degrees. In a food processor, combine the flour, sesame seeds, salt, and pulse to combine. Add the sesame oil and run the machine until the dough is crumbly. Add the water one tablespoon at a time, adding just enough until the dough forms a ball. Dust a work surface with flour and roll out the dough in four sections between. 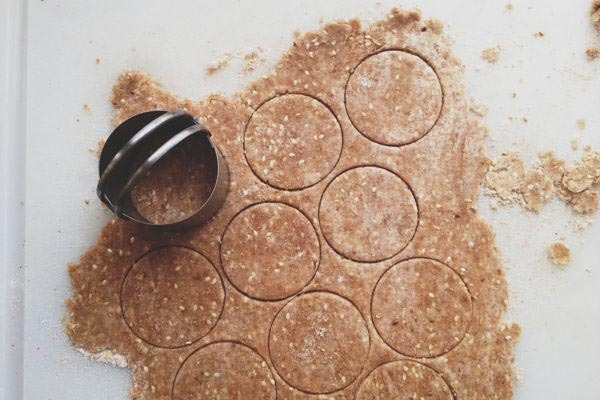 Cut into 1-inch circles with a cookie-cutter (or any desired shape), and place on a parchment-lined baking sheet. Bake for 15-20 minutes, until lightly browned. In a small bowl, mix the crème fraiche, chives, and season to taste with salt and pepper. You’ll want to use a lot of chives here. They really add a wonderful flavor and the flecks of green play nicely against the pink salmon. When you’re ready to assemble, place a small piece of smoked salmon onto each cracker, then pipe a dollop of crème fraiche on top using a pastry bag. If you don’t have a pastry bag, you can also use two small spoons; this method will take a bit more concentration. Nicole Gulotta is a grantmaker by day and gourmet home cook by night. She pens the literary food blog Eat This Poem, and founded The Giving Table, a website that helps people change the food system through personal philanthropy. She lives and writes in Los Angeles. I’m a fan of Eat This Poem and so it’s wonderful to discover your lovely space here! The line “become one with the one the world has told you to tend and treasure” really spoke to me. After 7 years of marriage I still find it hard to balance the expectations of friends with the needs of family. It does change things. But there is good too. Also, I would happily munch on the salmon and crackers for brunch. Thanks for visiting. I agree that the line you mention in the poem also speaks to me about contentment and being present in the present. Marriage does change things. Annelies, hello! So happy to have discovered your space through Nicole’s blog and your post there today. I, too, am a lover of food and poetry, and though my own blog doesn’t often touch on the latter, I love that you and Nicole are focused on the intersection of these two things — there’s so much beauty to be unearthed and explored. Thanks Stacy! Nicole and I do share a love of food and poetry… and good company. It’s great to connect and I’m glad to see you’re over in the East Bay. Your post today resonated, notably ” these days I can be so calloused if I’m not careful.” Here’s to each of us trying to discover wonder and keep our eyes open to it around us.